How does New York’s new smoke detector law affect you? If you’re buying a new smoke detector for your Western New York home, or even if you’re replacing the battery in an existing one, you’ll first need to pay attention to a new smoke detector law. New regulations dictate the type of smoke detectors that are allowed throughout the state, a move that aims to increase safety while reducing the risk of human error. The law, which was passed in 2015, goes into effect April 1, 2019. 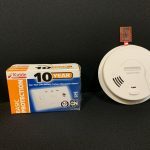 It requires all smoke detectors sold in New York State must meet one of two criteria: They must either be run by a non-removable lithium battery that lasts 10 years OR They are to be hardwired to the home’s electrical system. The average lifespan of a smoke detector is 10 years, so when the sealed battery runs out, the entire unit will be replaced by a new one. Old-style smoke detectors that relied on removable, disposable batteries will no longer be permitted. Once the law is in effect, retailers will only be allowed to sell detectors that align with the new regulations. Do I Have to Replace My Old Smoke Detectors? Eventually, yes. The goal is to replace all outdated smoke detectors with upgraded devices across all of New York, but Buffalo-area homeowners are not expected to immediately scramble to replace existing units if the existing units still work. You must, however, replace old units with new ones when the old unit needs to be replaced. What are the Benefits of the NYS Smoke Detector Law? The greatest benefit of the new law is ensuring smoke detectors can no longer be tampered with or subjected to human error. Old-style smoke detectors have removable, replaceable batteries, and batteries can be removed by anyone at any time. In fact, this is one of the main reasons the new law was even proposed. Many people remove the battery from the smoke alarms when they’re cooking, as old-style units are known to be highly sensitive to any type of smoke. People then often neglect to put the battery back into the alarm, leaving the household unprotected. Because the new smoke alarms contain a sealed lithium battery, there is no way to disable them. But you won’t necessarily want or need to. You’ll find the new smoke alarms are generally less likely to emit nuisance alarms than the old-style units. You’ll also find upgraded smoke alarms specifically designed for kitchen areas, with advanced sensors that can detect the difference between cooking smoke and a real fire. As a leading home inspection company in the Buffalo area, we know how important working smoke detectors are for you and your family’s safety. The new law helps to ensure every smoke detector throughout the state will be hard at work, keeping your household safe. © 2019 Specsure Property Inspections. All rights reserved.